Having it all isn’t always easy—especially when you’re a perfectionist—but with the help of her unconventional family and friends, an underwear-clad spiritual cleansing or two, and faith in herself, she’s learning to find her happy ending. 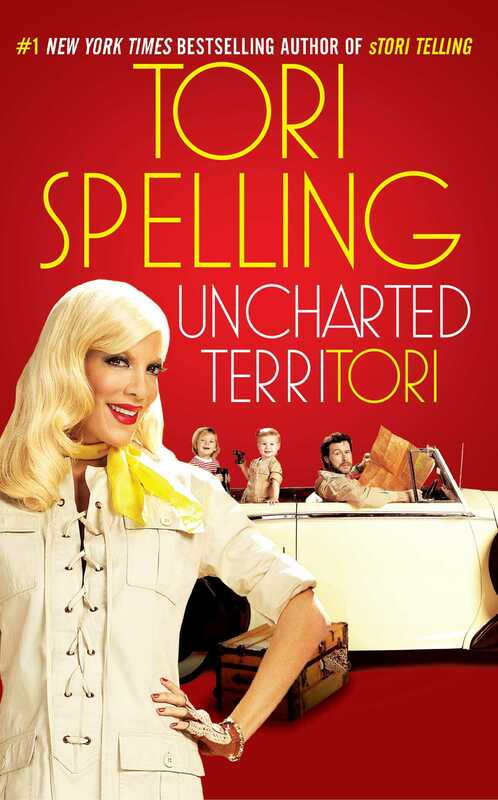 Because when you’re Tori Spelling, every day brings uncharted terriTORI. Just when you thought sTORI time was over, the beloved Hollywood starlet has so much more to say. A few weeks ago my friend Jacob was flying Virgin American from New York to L.A. As the plane began its final descent into LAX, the cute and obviously gay lead flight attendant made an announcement to the cabin. He said, “Welcome to Los Angeles, birthplace and residence of Tori Spelling.” When my friend reported this story to me via email, I thought it was hilarious, but I also didn’t know exactly what to make of it. I was born in L.A. Fact. I still live here. Fact. But on what grounds is that of common interest to an airplane full of diverse travelers? Is it a compliment? Is it a joke? A little of both? Of all the famous people, of all the actors, of all the tabloid darlings, of all the gay icons (if I can call myself that), why me? But as someone who produces and stars in a show that follows my daily life for the entertainment of millions of people (holy crap! ), I can’t spend too long on questions like that. After 90210and so many TV movies, my career had slowed, and recently, in my reality show, it has found new life. The name Tori Spelling draws viewers, and it sells magazines, books, a jewelry line, a children’s clothing line. And my name also, apparently, occasionally welcomes certain unsuspecting travelers as they arrive in Los Angeles. So it goes. I’ve come to accept that the small moments of my life, my relationship, my family, my business ventures—usually in edited, broadcast form—are a spectacle. My life is a show. My self is my business. My name is my brand. It’s a weird way to live, and maybe I’ll never get used to it, but at the same time business is booming. My life has changed dramatically in the past several years. I married Dean; we moved several times; we had two children; we created a show that has gone into its fifth season on the air. I have love. I have a family. I have a home. I have work. It’s all I ever wished for. But trying to be a perfect wife, mother, and mini mogul has its challenges, especially if, like me, you want to be perfect at all of them at the same time. I was poised to be a workaholic. In the seven years between 90210 and Tori & Dean, my acting work came and went. Being an underemployed actor as I was puts the fear in you. I am nobody. I’ll never work again. If I can just get a break I’ll make the most of it, I swear. I developed a strike-while-the-iron’s-hot mentality. I don’t want to miss a single opportunity. I want to do a show with Dean where we put together dream weddings on a budget: it’s on! There’s an opportunity for me to do the talk show I’ve always dreamed of? So what if it’s all day, every day, forty-four weeks a year, I want to do it! My agent’s worried I’m going to drop dead. Can we clone me? I wonder. Nah, the clone wouldn’t do it right. Yeah, I got the whole workaholic package, which means I’m so completely incapable of delegating that I couldn’t even delegate to my own clone. People talk all the time about leaving work behind at the end of the day, about how important it is to draw a dividing line between your job and your life. But my job is to be Tori Spelling. I can’t exactly take a break. In some ways I feel like I’m turning into my father. Dad was a workaholic. He was productive, work was lucrative, but it never stopped. When I was little I hardly noticed. I thought every father came home long after dinner and baths were over, just in time to kiss his children good night. Even late in his career, my father never stopped caring about every detail of every show. On weekends he would come home with a briefcase full of scripts. We’d go out to the pool together, I’d click open the briefcase, and we’d sit next to each other reading. He dog-eared the pages where he had notes, just as I now do with scripts. By the time he was finished with a script, every single page would be folded over and every line of the script would be rewritten. When we first started 90210 he even brought home Polaroids of the wardrobe options for Brenda and Brandon. He couldn’t delegate either. Ultimately I feel like my father died because he could no longer work. When he stopped working he went quickly downhill. There was no adjusting to a new focus and pace at that age. He didn’t know how to just be. Twitter—the way I use Twitter, is a perfect example of how it never stops, how I never stop. Sometimes Dean is sleeping next to me in bed while I tweet until one a.m. I tweet what I’ve prepared for the kids’ holiday parties at school. I post what movie I watched that night. I check to see how many followers I have. I check to see how many followers Brooke Burke and Denise Richards have (they’re in the big leagues, each with over a million followers). I’m obsessed with how many followers I have and what makes them decide to follow me or to stop following me. If I talk about cute things the kids are doing, my followers drop off. If I retweet news items, people sign on. If I don’t tweet for a day, I gain a hundred followers. When I posted that I watched Paranormal Activity, I gained fifty-six followers. Why, why, why? I tell myself I’m doing it for the fans and for my business; I’m building my brand. And I do use Twitter that way. For Little Maven, my kids’ clothing line, I went on Twitter to do a model search. People posted photos of their children to Twitter, and I selected models for our look book—a catalogue for retail buyers—and website. My “followers” know that it’s me looking at the pictures. I’m the one who’s picking their kids. They know that I’m not doing a celebrity endorsement, that I’m actually at the helm of my business. And they also know that I’m the one who’s dropping my kids off at school. Because I tweet about it afterwards. It’s kind of like I’m stalking myself, but it doesn’t feel creepy. It makes me feel connected to people. If I’m going to be a brand, it’s nice to feel like people really know me. But I also see how my obsessive twittering can be unhealthy. Nothing is private, nothing is sacred. Dean is asleep next to me, and I should be sleeping too. I’m more stressed than I’ve ever been in my life. I haven’t found a good balance, and (when he’s awake) it doesn’t sit well with Dean. A couple of nights ago Dean came into the kitchen and told me he’d run a bubble bath for me—an overt effort to get me to relax. Liam and Stella were running around the kitchen, waiting for me to make them dinner. Dean said, “Don’t worry, I’ve got it.” Dean is perfectly capable of making dinner for the kids. Nonetheless, I started pulling out the broccoli, rice, and hot dogs. Just to get him started. Dean stood there staring at me. “What are you doing?” he said, “I just said I’ve got it.” But I couldn’t stop myself. I’m not just controlling when it comes to the kids. I came into the kitchen the other night to find Dean, who is self-sufficient in all things, eating a dinner he’d made for himself. When I saw him sitting there, alone at the table, I felt deflated. “I was going to do that for you,” I told him. I wanted to make dinner for him. I wanted us to eat together even if I got home too late. I want to be able to do everything. Then I’m resentful of having to do everything. And that’s how it all implodes. Maybe this is what happens when you finally find success in a career that you love. Maybe it’s a side effect of having children. Maybe it’s my childhood coming back to haunt me. Whatever it is, it’s taking a toll on me, on my health, and on my family. I’m exhausted, if not sick, half the time. The rest of the time my marriage, my family, and my job together are my dream come true. But those two sides of my life—exhausted and elated—are constantly vying for Tori dominance (not quite as critical as world dominance but try telling that to my immune system). The struggle plays out in Malibu and Maui, on a tour of local L.A. hospitals and across the country in an RV. Somehow in realizing my dreams I’ve lost my ability to just be. My reality is my job, and that means that my work and my life are completely woven together. It all happened so quickly that I haven’t begun to establish any boundaries. My life is all out of balance, which has turned out to be a biggie. I got everything I thought I wanted … and it practically destroyed me. I need to make a change. I don’t know how and when I’ll do it, but that search is the challenge and the journey.